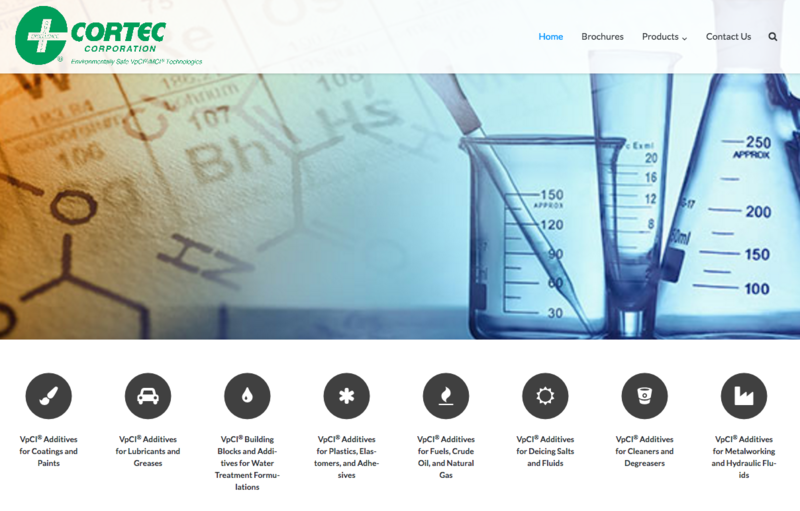 As part of renewed efforts to deliver corrosion protection to the specialty additives market, Cortec® Corporation has launched a new website devoted to Cortec® VpCI® brand additives. Anyone interested in enhancing the corrosion inhibiting properties of paints, water treatments, lubricants, and many other materials can go directly to www.cortecadditives.com for an informative overview of what Cortec® has to offer. While Cortec® has developed hundreds of innovative corrosion inhibiting products, its additives line focuses on corrosion inhibitors that manufacturers or industrial users can add directly to their own products or systems for enhanced metal protection. Cortec’s VpCI® additives integrate many technologies along with proprietary VpCI® chemistry in order to eliminate corrosion caused by corrosive fluids, chlorides, or humid environments. When implemented, these additives ultimately cut costs such as those associated with expensive alloys, corrosion claims, and labor. Each category is linked to its own page of additive options. Evaluation of the best additive for the target application is always recommended to ensure compatibility and best possible performance before wide scale implementation. Charts at the bottom of each page guide selection based on additive characteristics such as transport mechanism, solubility, and metal types protected. Additional Cortec® expert advice is available by using the website’s “Contact Us” page. News updates and related brochures can also be accessed on the site. Many of Cortec’s additives provide both excellent contact corrosion protection and additional vapor phase corrosion protection for metals in void spaces. When introduced to a void space, VpCI® molecules in these additives vaporize and diffuse throughout the enclosure and adsorb on metal surfaces. This thin molecular, hydrophobic layer protects the metal against corrosive elements such as oxygen, moisture, and chlorides whether or not the metal is in direct contact with the additive. As such, VpCI® chemistry is an important advantage for situations where direct contact is impractical, as in systems with extensive or intricate void spaces. Cortec’s line of additives includes many environmentally-friendly options, such as water-based or biodegradable components and also products that reduce the overall use of hazardous materials by streamlining corrosion inhibiting processes. Unlike corrosion inhibiting systems of the past, many Cortec® additives do not contain chromates or other heavy metals, nitrites, or chlorinated hydrocarbons. Coating additives that increase the protective qualities of water-based paints (increasingly desired for their greater environmental friendliness). Lubricant and grease additives for gear box oil and brake fluid that provide vapor phase and contact protection to metals in surrounding enclosed void spaces. Water treatment additives such as antiscalants, vapor phase corrosion inhibitors for various process water applications, and a low toxicity hydrazine alternative for boilers. Additives that enhance plastics, adhesives, and elastomers with corrosion inhibitors to protect adjacent metal parts or equipment. Fuel, crude oil, and natural gas additive options for protecting heavy equipment diesel fuel tanks during shipment or for protecting natural gas and crude oil gatherings and transmission lines with vapor phase, neutralizing, and film-forming corrosion inhibitors. Additives for deicing salts, metalworking fluids, and cleaners (including an in-can rinse additive) that offer built-in protection of metal parts and equipment exposed to these naturally corrosive elements. A special hydraulic fluid additive available for vapor phase and contact corrosion protection in subsea hydraulic systems. With a host of corrosion inhibiting options, Cortec’s new website introduces many valuable resources to the specialty additives market. Manufacturers who want to enhance the value of their product or industries that want to add corrosion protection directly to their operations can browse the website to learn more about Cortec’s broad range of helpful additives to fight corrosion. Additive Enhances Corrosion Protection Featured in NED Magazine! New Cortec Additive Enhances Corrosion Protection of Water-Based Coatings Systems Featured in Coatings World Magazine! Cortec M-120 Additive Enhances Corrosion Protection of Water-Based Coatings Featured in Canadian Metalworking Magazine! Additive from Cortec Featured in PCI Magazine! New Cortec® Additive Enhances Corrosion Protection of Water-Based Coatings Systems Featured in IPCM Magazine!